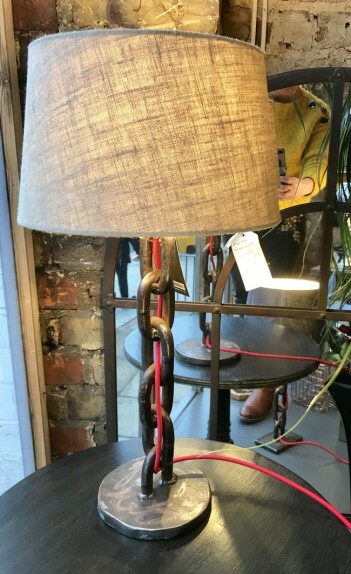 These unusual table lights have been handmade in Wales from disused boatchain. Available in two designs, one has a round base and one has a oblong base. The lamps have been professionally wired. Only these two available. The prices shown are for a lampbase only, the shades are not included. Height approximately 50-55cm tall including bulb, Width 15 x 10cm (oblong base) and 15cm diameter (round base), Bases are £89.00 each. These are heavy! For collection or free local delivery only please.